Cooking Pots and Ovens give increase to player. --Mod does not add scripts, so you can remove without worry of orphaned scripts. using a "Needs Mod" like "Imps More Complex Needs" or "Realistic Needs&Diseases [RND]". 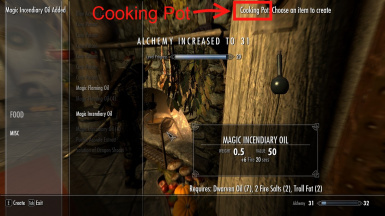 --However, most "Cooking Skill" mods only applied Alchemy Skills towards cooking pots; none existed for Ovens. 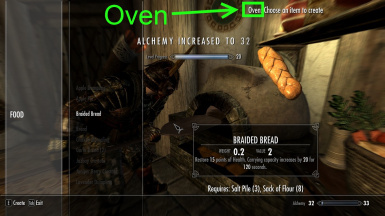 --Thus, I created this mod to apply "Alchemy Skills" to the various "Cooking Pots/Spits" and "Ovens". --Should be compatible with most mods. Not compatible with mods that directly alter Cooking Pots/Spits or Ovens. --Do whatever you want with this mod. All I ask is credit for my work if you do use it.